This Sunday morning we all woke up tired. My husband rushed Agasyta off for an early soccer class after breakfast while I pottered around the kitchen, thinking about what to do for lunch. Yesterday, I had found leggy thin-skinned purple Asian eggplant in an Indian grocery store. I pulled them out this morning, wondering if I could make my mother-in-law’s unusual eggplant in ginger-chilli masala dish. I remembered the recipe vaguely from watching my mother-in-law make it, but made the wise decision of calling her as I sliced the eggplant into thick 3-inch long by 1-inch wide pieces. “How much eggplant do you have?” was her first question. About two pounds, I remembered from the cash register at the store. She rattled off a list of the simple ingredients needed – onion, ginger, green chillies, fresh coriander leaves, white sesame seeds, cumin seeds – and the appropriate quantities. The dish embodied everything of Andhra cooking that I had come to learn: simple, fresh and sharp-tasting ingredients, spices used sparingly, and big pieces of vegetable which meant less chopping. A new recipe. I was excited but afraid at the same time. It took at least two more phone-calls to my mother-in-law to report on the progress of the eggplant. She stayed by my side, guiding me through questions such as “should the eggplant be cooked covered or uncovered?” and “at what point is the wet masala added to the frying eggplant?” There was a tense moment or two when I discovered that the ground onions were bitter and imparted an ugly taste to the dish (the bitterness of the onion wore off gradually as the dish cooked). But the finished dish tasted close to my mother-in-law’s. When my husband came home and found the eggplant on the stove, there was a noticeable softening in his eyes. His shoulders relaxed and he gazed at me with a new tenderness. It made me wonder, what is it about one’s mother’s cooking, even a first attempt, that can bring such comfort. Heat the oil in a pan and sputter the cumin seeds. Cook the eggplant slices in the oil on medium to low heat, covered. When the eggplant is halfway done (soft but not fully cooked), add the the wet masala. Cook uncovered for a little while until the masala releases oil or until the raw taste of the onion disappears and the eggplant is cooked through. 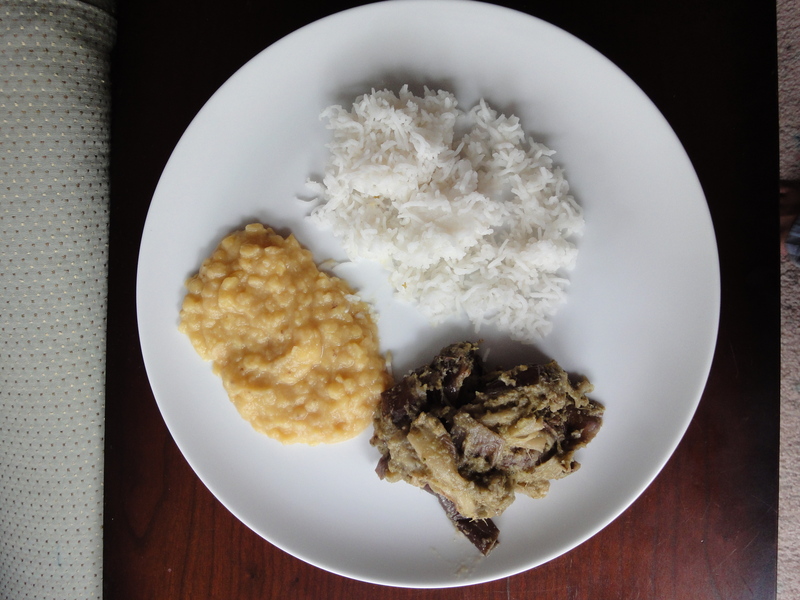 This dish is eaten in a traditional Andhra-style, with plain toor dal and white rice.